Fighters. This is the word I would choose to describe my incredible team and their performance in 2014. The pursuit of the end of extreme poverty is a slugfest—a fight where the hopes, dreams, and lives of millions hang in the balance. It is a humanitarian crisis on a global scale that will affect all of us in the coming years. As I look back on 2014, I see battle scars that my team incurred from some of the toughest obstacles we ever encountered in this fight since we started this journey six years ago: Kenyan Country Director, co-founder of Nuru Kenya, and visionary Philip Mohochi passed in a tragic accident; a lethal maize disease hit our farmers again this year in Kenya; corruption, thievery, and threats on the lives of our team plagued the project in Kenya; and the Ethiopian team struggled with unanticipated changes to government policy that inhibited program design and threatened to set back months of work. My team stood up in the face of these challenges, and I was so inspired to see them push through seemingly insurmountable obstacles to hit and exceed our targets this year. Because of their relentless perseverance, we gained important ground in the fight against extreme poverty this year and thousands of farm families in Kenya and Ethiopia were transformed forever. Year after year, we share stories of some of these farmers who were once suffering in horrible poverty…farmers who join Nuru’s programs, take their future into their own hands, and change their trajectory. For those of us who see the conditions of extreme poverty first-hand, these stories never get old. Farmers like Joshua and Amarch inspire us to continue fighting. Nuru Kenya: We accomplished Exit Phase 1 in Kenya, which means Nuru International (NI) staff turned over the management of all four impact programs to Nuru Kenya (NK) staff. NI staff have left the project. This is a significant milestone, showing that NK leaders have the skills and abilities to independently manage their programs! Team Leader, Alex Martin, will lead the team to complete expat exit from Nuru Kenya by July of next year. In addition, Pauline Wambeti fully assumed her role as Nuru Kenya Country Director. Pauline is an incredibly talented leader with the skills and experience to lead and scale Nuru Kenya to empower additional regions of Kenya out of extreme poverty in the coming years. Nuru Ethiopia: We implemented our new Program Planning Process (PPP), a design process that we use to co-create our four impact programs in a new country project. The PPP helps break the cycle of extreme poverty by listening to the needs and ideas of people living in extreme poverty; providing Nuru leaders with training in analysis, synthesis and design; and co-creating an ecosystem where Nuru leaders can exercise their power to create change. Our team completed the PPP for Agriculture and Financial Inclusion, and Healthcare and Education PPPs are well underway. In addition, our first ever harvest for Nuru Ethiopia with our pilot group of 488 farm families was a success! Social Enterprises: We officially launched our for-profit holding company, Nuru Social Enterprises (NSE), led by Nisha Chakravarty. NSE is designed to fund the work of our local community development organizations (like Nuru Kenya and Nuru Ethiopia) by investing in local entrepreneurs and incubating a diverse portfolio of profitable businesses, such as Poultry and Dairy in Kenya. Leadership + Monitoring and Evaluation: In partnership with Thomas Hong, our Leadership Program Director, the Monitoring and Evaluation (M&E) team created and launched the Leadership Sustainability Index (LSI), a tool used to indicate when Nuru leaders are achieving the necessary objectives to operate their local community development organization independent of Nuru International (NI) staff. Our M&E Director, Veronica Olazabal, presented the LSI at the 2014 American Evaluation Association conference where she was also honored with the Alva and Gunnar Myrdal Evaluation Practice Award. Country #3: Our Director of International Operations, Aerie Changala, codified our theory of change, six years of lessons learned, and graduation model to give us a roadmap for future country projects. With our goal to launch a third country within the next two years, Aerie and team have begun researching the viability of working in fragile states and will be conducting site visits to possible country project sites in the coming year. Team: We saw some very exciting additions to our core Nuru International leadership team in 2014, including Marc Rahlves as our Chief Operating Officer and Mike Bigrigg as Team Leader for Nuru Ethiopia. In addition, Raj Kumar, founder and President of Devex, joined our Board of Directors. This year, we were humbled and honored to gain visibility through various awards and media outlets. We were honored by the Dalai Lama, the White House, and through a Social Impact Fellowship with Gerson Lehrman Group. We’ve shared our story via Christian Science Monitor, BBC World Service, Forbes, Devex, ABC News, Al Jazeera, Huffington Post, TEDxBYU, KSL TV Salt Lake City, ONE, WV Living, and Awakin. Our hope is that more and more people will hear about our work and invest in the sustainable transformation of entire communities in the developing world. We are so thankful that supporters like you recognize the importance of our work and are continuing to contribute financially to our vision. You are a critical part of our team, and I thank you for standing steadfastly by our side in this fight in 2014. We could not have achieved the success we did this year without you. Our work is not done and the fight rages on, but we have much to celebrate about 2014. 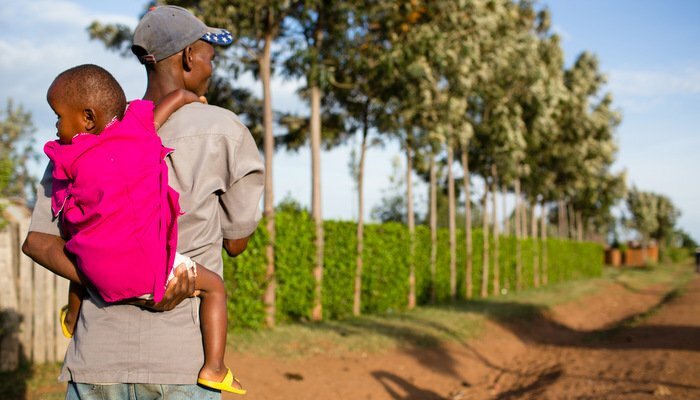 Fathers and mothers now able to provide for their children today are starting to plan ahead for tomorrow; and Nuru is poising for scale regionally, as well as globally. 2015 will certainly bring daunting challenges that we cannot foresee, but as I look back on the gains we were able to achieve this year together, I have one thing to say to 2015…bring it. I didn’t know about Nuru until I read Nisha’s post at Next Billion. I have since then checked what Nuru does and it is quite mind blowing. It is a model that will achieve great results. Do keep up the great work and good luck in getting Nuru into another country. I am glad to read that Pauline Wambeti will be the one to spearhead Nuru’s model entry into other parts of Kenya. I wish it is a model that can be franchised for faster penetration since the lessons learned are helpful in making model replication easier.